This title offers the guidance and know-how to give any sewer the confidence to create stylish coats and jackets. The creative projects and styling suggestions will have fashionistas rushing to their sewing machines. The real key to always looking stylish is having just the right mix of coats and jackets. Wendy Mullin of Built by Wendy shows even new sewers that these multifunctional wardrobe pieces are not as daunting to make as they might seem. Stylish women know that coats and jackets are some of the most important and lasting garments in a wardrobe. Yet even for advanced sewers, they seem too intimidating to tackle at home. With her trademark wit and expertise, Wendy puts those fears to rest. 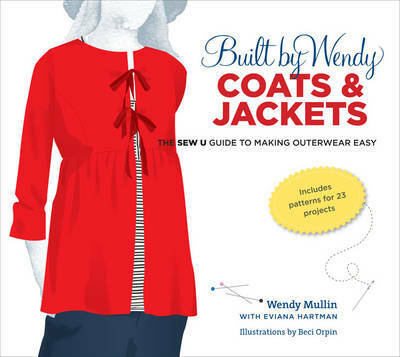 In "Built by Wendy Coats & Jackets", she offers the guidance and know-how needed to give any sewer the confidence to create 23 different outerwear options using the three enclosed patterns. She offers tips and shortcuts that she has learned over the years, from choosing the right needles for various coat fabrics to the easiest way to sew a lining. From a faux-fur bolero jacket to throw over jeans to a Chanel-like dinner jacket in boucle, the creative projects and styling suggestions will have fashionistas rushing to their sewing machines.